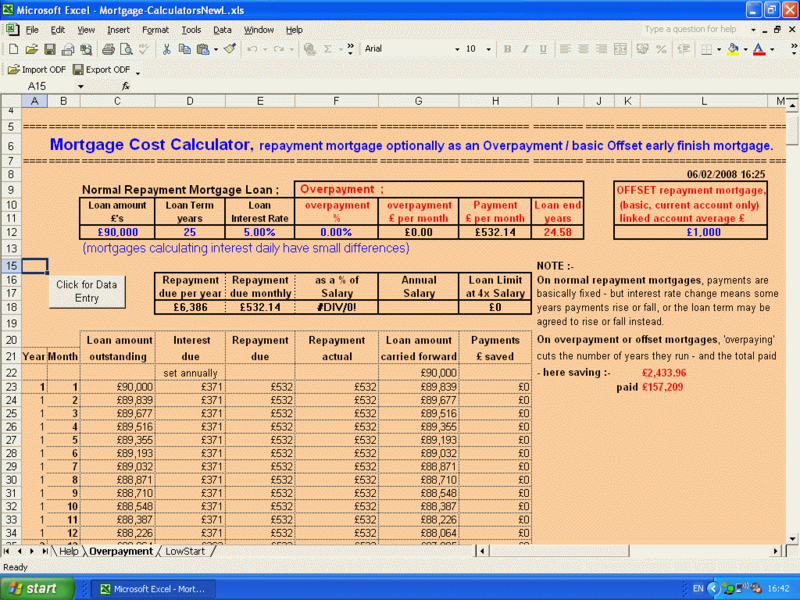 - The best Excel mortgage cost calculators. to easily cost Repayment, Overpayment, Low Start and/or basic Offset mortgages. If you need or want a mortgage, then you can easily get a mortgage that is not the best one for you. Mortgages are often mis-sold by sellers claiming to be experts. One day they all push Endowment mortgages, then Repayment mortgages or Low Start mortgages or Overpayment mortgages or Fixed Rate mortgages or Offset mortgages or Tracker mortgages - and each type will also have different interest rates available. 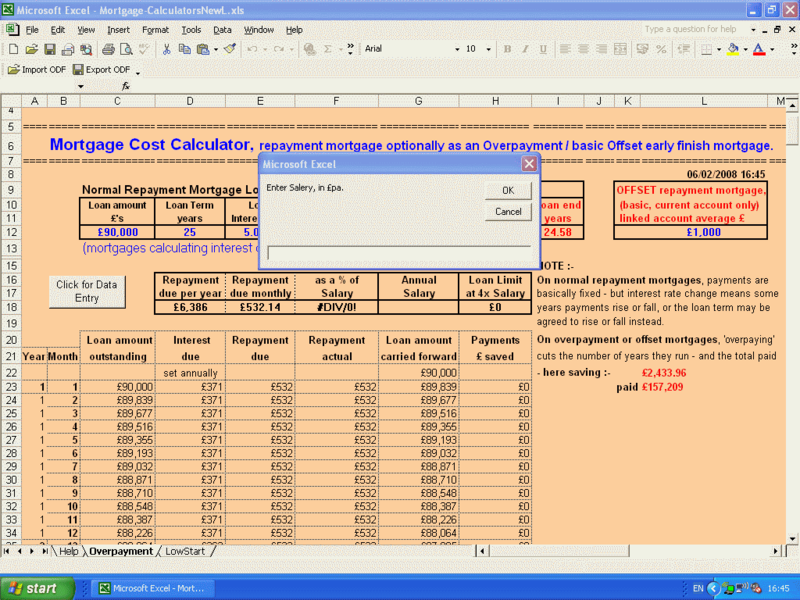 Our pair of automated Mortgage Calculators in Microsoft Office Excel are a MUST for anybody really concerned with the costs of mortgages. Both calculators will cost normal repayment mortgages, one annually and one monthly, and interest-only mortgages and interest for endowment mortgages. They are currently used in the UK, USA, Canada and elsewhere. Our low start calculator can also calculate the cost of a low start deferred loan mortgage that may suit a career-starter on a low starting wage who can reasonably expect to move up to higher wages (eg as in public sector jobs with seniority increments and promotion prospects). And our overpayment calculator can calculate the cost of an overpayment and/or basic offset mortgage (linked only to a current account) - and what savings are made by overpayment and/or current account linking as well as how much earlier they make the mortgage finish - suiting the established professional who can afford to make a bit higher mortgage payment as a form of tax free saving. It also automatically gives a table and graph of overpayment savings for any mortgage input, and can also calculate the effect of making individual extra payments if the mortgage allows that. So, as an alternative to a normal repayment mortgage, a new graduate might reasonably be advised to get a low start mortgage and 10 or 15 years later switch to an overpayment mortgage. Also an Offset repayment mortgage linked to current and/or savings accounts works like an overpayment mortgage to an extent that depends on the amount of money in the linked account(s) and on savings account interest and tax rates. Use these easy automated Mortgage Calculators to cost different types of mortgage and their affordability. And assistance is available through this website if needed. Suit all Microsoft Office Excel versions from Excel97 onwards, and standard version can be downloaded when order completed. Currently used in UK, USA, Canada and elsewhere. 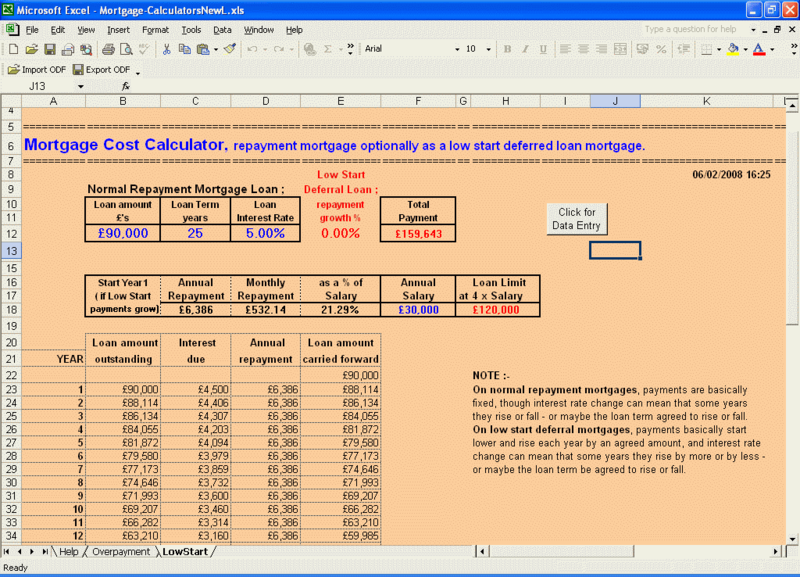 Get our pair of automated Excel mortgage calculators now reduced from £19.99 to only £9.99, or customised eg with your logo and to work in dollars for only £8.00, by clicking Excel Calculators. OR if you are considering a Buy To Let property investment and have access to Excel, then easily do your own costings with our very helpful Buy To Let profit calculator that includes an easy separate mortgage calculator - click Buy To Let profit calculators. OR see our automated Excel shopkeeper POS point of sale system in Pounds or Dollars now only £20.00, by clicking point of sale systems. AND we do our own great Excel Shared Ownership Home Cost Calculator as well as our housing developers great Scheme Development Appraisers at good prices. AND you can download our FREE automatic Excel Free Math-Sheet calculator-printers for different ages. Or you may want to learn a bit about French kissing, online dating, love and marriage.